Rayla is an Elemental, but she doesn’t learn this about herself until after she leaves home for college. She also finds out that Elementals are wanted/hunted by fae lords as prospective mates. Elementals are able to bond with a fae lord and it increases the power in both parties. Rayla has four lords who are serious about courting her. Most Elementals can only influence one element. Rayla can manipulate all of them, though she hasn’t learned how to control it yet. There is not a lot of action in this first novel. We meet Rayla, a few of her friends, and the lords. 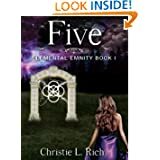 We spend most of this novel learning about the rules associated with the fae and Elementals, and also with Rayla as she gets to know each of the lords. I’m a hopeless romantic, so this part was great, the sexual tension hot, and descriptions very good. If you’re seeking a lot of action over romance however, it might not be for you. My number one test for any novel is judged by how fast I read it. If I’m still struggling through after a week or more, not good. I read Five by Christie Rich in two. It would have been one if outside life had kept out of the way. So this gives the novel an automatic top score in stars. But then I have to take into account editing, typos and such. This tripped me up quite a few times, more of a distraction than outright irritation, but I do hope for better when I read the second novel in the series. I also ran into a few problems where character development and believability are concerned. Rayla and Cassie are supposedly best friends, but I felt through most of the story that they more or less just tolerated each other, which didn’t work for me. I also questioned Rayla’s willingness to accept all this weirdness with hardly a blink. I know how I would’ve reacted if placed in her shoes and this was nowhere close. Her attraction to the fae is believable enough when she is in their presence. I get (and liked) the power they seem to hold over her. What I couldn’t get was why she still thought well of some of them out of their presence. She seemed to fall into and out of love too easily. The aunt who raised her also didn’t come across as loving, or even fearful about the danger Rayla had put herself in. She almost came across more as an afterthought, which I thought was strange. So these are the two greatest faults with this story in my opinion–editing and character development. I’m going to take one star off for each– though probably more a 3.5. It is still a fast, fun read and I have no problems recommending it to my family and friends. I’m looking forward to part two. Posted by Denna Holm on August 19, 2012 in Archives and tagged bond, elemental, fae, fae lords, fantasy, paranormal, Romance.